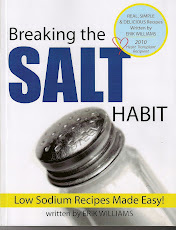 Good article about helping you to reduce your sodium intake. Mix all ingredients except cabbage, carrot, and onion. In a different bowl, combine cabbage, carrot, and onion. Pour liquid over cabbage mix and let set overnight. The longer the slaw marinates the better the flavor. Here is a link to a good article on tips on how to help cut your sodium intake. Bake potatoes for 1hr or until done. (To speed up prep time cook potatoes in microwave.) While potatoes are cooling, cook bacon, crumble, and set aside. In a large bowl, combine milk, sour cream, 1/2 cheese, and 1/2 green onions. Mix with hand mixer. Set in refrigerator until potatoes are done. When potatoes are done, let cool, and cut lenghtwise. Scoop out flesh of potatoes into bowl with sour cream mixture and mix well. Spoon mixture back into potato skins and top with green onions, cheese, and bacon. Bake for another 15 min. This is a great article and great examples of how much sodium is in restaurant food. In a shallow dish, add flour, pepper, onion powder, garlic powder, and paprika. Heat unsalted butter in a large skillet on medium-high heat. Dip pork chops in flour mixture and shake off excess. Place in skillet and brown on each side for 10-12 minutes. In a medium bowl, add remaining ingredients. Once pork chops are done remove from skillet, reduce heat, and add honey mixture. Heat for 2-3 minutes and add pork chops back to skillet. Spoon sauce over pork chops.